There is nothing fast about any part of my making process. The first step involves a visit to the brick plant where I get the clay that I use to make my work. As I drive by the magnificent old bee hive shaped kilns at Shaw Brick in Lantz, Nova Scotia there are endless stacks of bricks and chimney flues made from the rich red clay dug on site. Fine, strong, and wonderfully malleable this is a prince among clays, and one of the most superb earthenware clays in the world. I am truly fortunate to be able to use this gorgeous Nova Scotia clay which is such a pleasure to work with. Back home in the studio, the making process begins. There is a good deal of thought that goes into a piece before I even touch the clay. Sketching, drawing, and consideration of colour, design, and surface treatments are essential parts of the process. 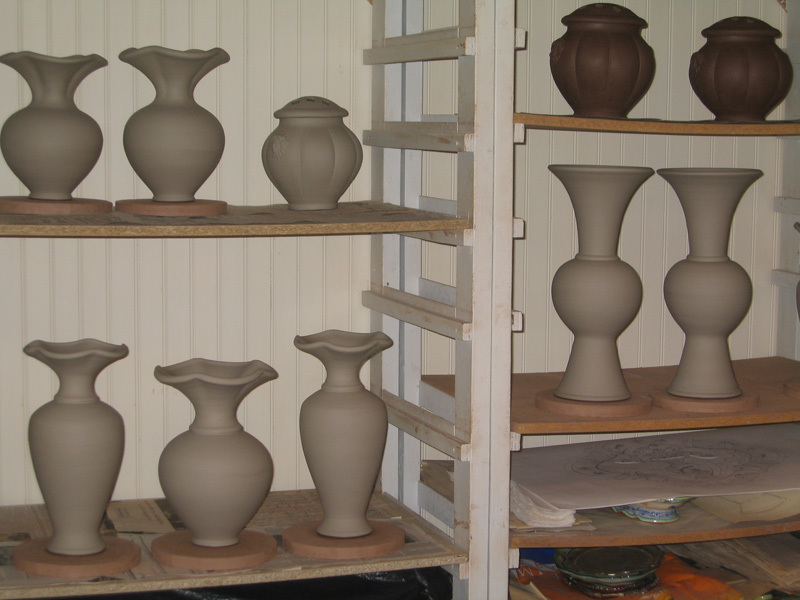 I use several forming techniques; initially either handbuilding from slabs or throwing on the potter's wheel, the forms are then altered from their initial shapes and combined with various other parts in the construction of a single piece. It's a delight to breathe life into this luxurious clay, so open to any form or expression that I suggest. The next stage is truly sensual. 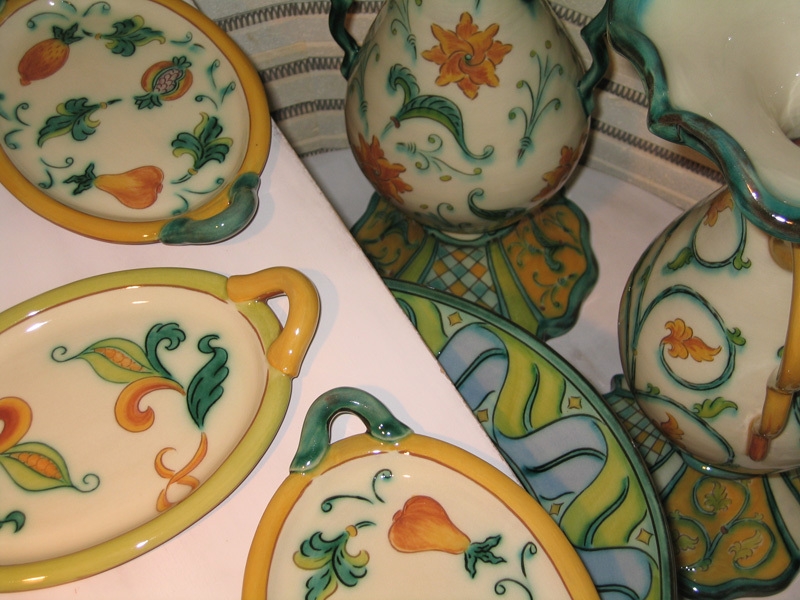 I coat each piece with a luscious slip, a liquid white clay the consistency of melted ice cream. This is done by either dipping the piece in the slip or painting it on the surface with the softest of brushes. Once this voluptuous coating has dried somewhat, to the consistency of a chocolate bar, the decoration process can begin. I draw my designs through the white slip revealing the red clay body beneath. 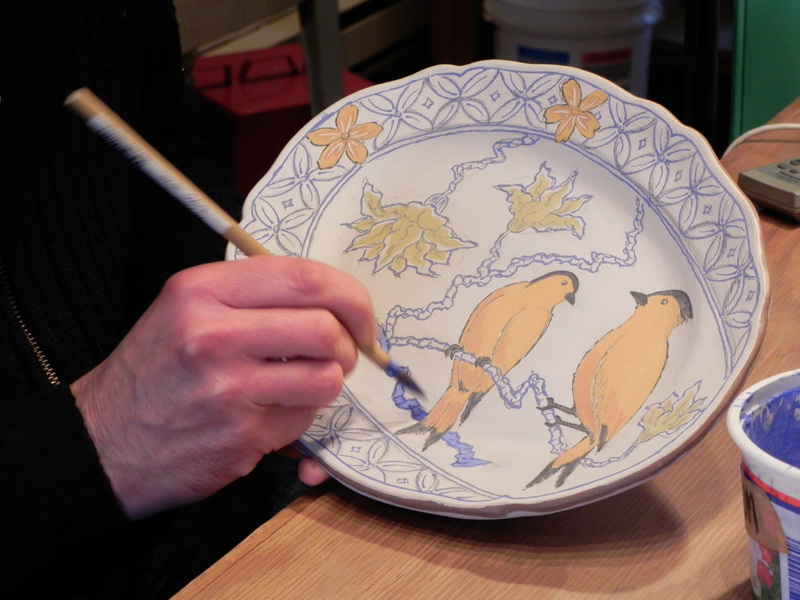 This sgraffito technique provides a strong outline for the next stage of the process which involves painting numerous colours and materials, each applied with a particular effect in mind. Some are stiff and solid, others melt and flow. Each step is careful and considered, each step has to be carried out when the piece is at exactly the right consistency. The piece is then slowly dried, fired once, glazed with a profoundly yummy clear glaze, and fired again. The overall effect in the finished piece is one of rich layering, of building up and drawing through, of a complex surface where all the parts relate to the whole. It's a time consuming process taking approximately six weeks from start to finish. Three decades of practice has taught me how to bring life to this exceptional material, as sturdy as a brick, as sensual as chocolate, and as beautiful as the finest work of art.